CORPUS CHRISTI, TX - Certified benefits counselors from the City’s Parks and Recreation Department Senior Centers can help consumers 60 and older apply for Medicare Savings Programs and Extra Help for Medicare Prescription Drug Coverage benefits and answer their questions, said Lisa Oliver, Superintendent of the Senior Community Services Division. The assistance is also available for caregivers of seniors 60 and older. 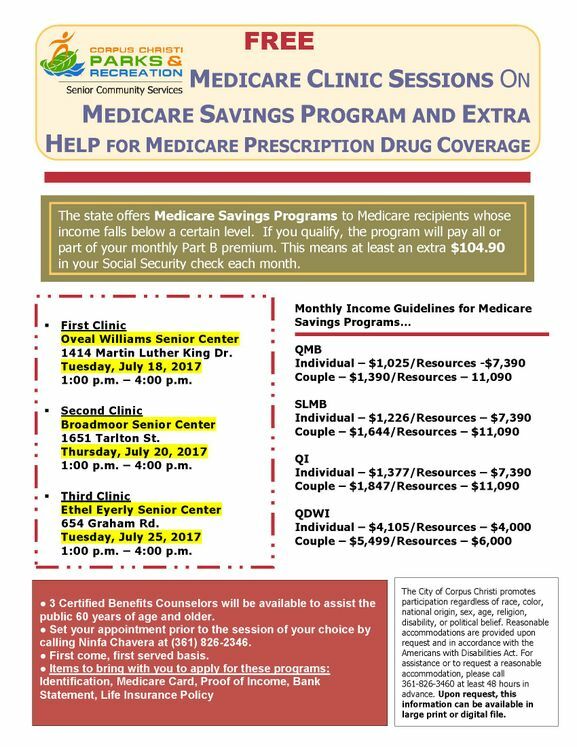 The state offers Medicare Savings Programs to Medicare recipients whose income falls below a certain level. If you qualify, the program will pay all or part of your monthly Part B premium. This means at least an extra $104.90 in your Social Security check each month. Oveal Williams Senior Center, 1414 Martin Luther King Dr.
Broadmoor Senior Center, 1651 Tarlton St.
Ethel Eyerly Senior Center, 654 Graham Rd. Appointments can be made by calling (361) 826-2346 . Walk ins will be seen on a first come, first served basis; unless an appointment is made in advance. It is important to bring the following items with you to apply for these programs: Identification, Medicare Card, Proof of Income, Recent Bank Statement, Life Insurance Policy Explanation of Coverage. Benefits counselors also provide one-on-one counseling services to seniors on housing, including landlord- tenant and housing and property issues; surrogate decision making, such as wills and advanced directives and income maintenance, such as food stamps and Social Security. The Senior Centers do not provide financial assistance, but can provide referrals to agencies. For more information, media representatives can contact Senior Community Services Superintendent Lisa Oliver at (361) 826-3132 or at lisao@cctexas.com.